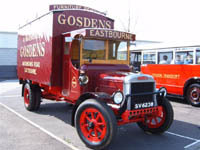 After many months of preparation, our 1924 Leyland A1 Removal Truck was ready for the Historic Commercial Society�s 44th London to Brighton Run. 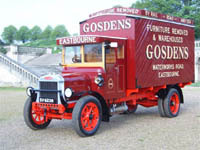 The Leyland truck, �Archie� to his friends, had been painstakingly painted in early 20th century Gosden colours, complete with sign writing in the style of the time. The only problem encountered during sign writing was obtaining an image of the household removal association emblem of those days. 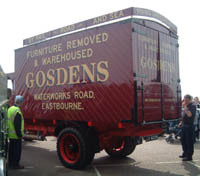 The association was then called the �National Association of Furniture Warehousemen and Removers� (NAFWR), and was the forerunner of today�s �British Association of Removers� (BAR). We did however, attempt to reproduce an emblem, which we hope is not too different from that actually used. 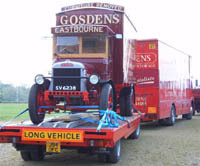 Sunday morning 1st May 2005 meant an early start for Michael Gosden, Dave Morton and mechanic Brian Ray as they left Eastbourne at 5am with Archie loaded on the back of our trailer for transporting to the starting position at Crystal Palace, London. The departure time of each vehicle taking part was staggered, so as not to cause problems for other road users. Our vehicle was one of the last to leave Crystal Palace on its journey to Brighton, leaving at about 8.30am. Travelling at a maximum speed of around 15mph with Dave Morton at the wheel for the majority of the trip and taking some 6 hours to complete. Unfortunately, as the starting time in Brighton for judging of the entries was 1.00pm and our arrival time in Brighton was about 2.00pm we were not able to be judged. Rather disappointing for us, but despite this the whole event was most enjoyable and the crowds that gathered around our vehicle was most encouraging and made the time and effort taken by all concerned most worthwhile. 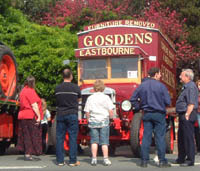 The day after the London to Brighton run brought another busy day for Archie, as he appeared at the Magnificent Motors display organised by Eastbourne Borough Council. 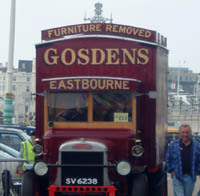 This event which took place on the Western Lawns on the seafront of Eastbourne, just opposite the Grand Hotel, was another crowd attraction for Archie. We must give many thanks to Chris Wright for the many hours of work, above and beyond the call of duty, in restoring Archie to the magnificent vehicle that he now is. Thanks must also go to Brian Ray of JTB Commercials for ensuring that Archie�s engine was up to scratch, and for his attendance on Sunday and the days prior to the weekend for making sure that the two days went without a hitch, and also many thanks to Dave of Patten Signs, Seaford for the excellent work on sign writing our vintage vehicle. Finally we must give thanks to the many people who over the weekend showed such a keen interest in Archie. Don�t forget there are more events we shall be attending during the summer. Watch this space and our news pages for more details.